Earlier we were discussing the basics of roller bearing and its various types, we have also seen the ball bearing seals,shields and snap rings in our last post, and today we will see here the basics of ball bearing and also its various classifications. Ball bearings are available in various sizes as such bearings are used in wristwatch and also used in heavy load applications in various heavy industries. 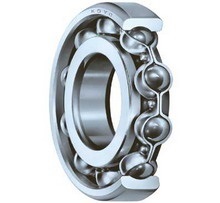 Similar with other bearings, ball bearings will also have inner ring, outer ring, rolling elements and cage. Ball bearings will also have the similar functions that we have already discussed in our post “Various functions of a bearing”. There are basically four types of ball bearings used in industries as mentioned here, We will see here each type of ball bearing in detail and also their advantages and applications in industries. In ball bearing categories, Single row ball bearings are widely used in various applications. Single row ball bearings will have single row of rolling elements between inner ring and outer ring. There will be a cut of crescent shaped in outer ring and in inner ring within which rolling elements i.e. balls will role. Single row ball bearings are primarily designed for bearing radial load, but these bearings with deep grooves can bear thrust load also in either direction. Such bearings are used in industries for various applications where load will be light to medium as well as constant in nature i.e. not shocking in nature. In a case where shaft diameters are large and load is high, roller bearings are preferred instead of ball bearings. We must be sure about the alignment during the installation of such bearings as alignment of inner ring and outer ring between shaft and housing are very critical and important for better service life of such bearings. As we have discussed in our previous post, seals and shields are also available with ball bearings in order to avoid the entry of dust, moisture or any other foreign particles in to the bearings and therefore they help to secure the better service life of ball bearings. There is one more version of single row ball bearings which is usually termed as maximum capacity bearings and there is one very important feature associated with maximum capacity bearing and that is additional rolling elements i.e. 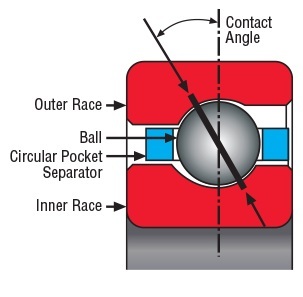 ball could be assembled for securing the higher radial load capacity. Single row ball bearings are used in various applications such as wristwatch, electric motor, pump, transmission, steering gears, differential, medium duty gearboxes and various other light duty medium applications. Angular contact ball bearing, also termed as spindle ball bearings, will support the load between opposite shoulders of inner ring and outer ring. Angular contact ball bearings are capable to bear heavy thrust load or axial load but angular contact bearings must be used in pairs or in combinations. Angular contact ball bearings are also termed as unidirectional thrust bearings those are quite capable to bear thrust load and also moderate radial loads. Angular contact ball bearings are widely used in clutch release mechanism. Contact angle in angular contact ball bearing is defined as the angle between a line perpendicular to the axis of bearing and the line joining the contact points of ball and raceways in radial plane. Contact angle for angular contact ball bearing will vary from 15 to 40 degrees. Double row ball bearings will have two row of rolling elements i.e. balls and there will be very less axial displacement and therefore double row ball bearings will have better radial load bearing capacity as compared to single row ball bearings. Double row ball bearings will also provide good performance under thrust load in either direction. In a case where load bearing capacity of single row ball bearings are not enough, in that situation double row deep groove bearings could be used. Double row ball bearings will have better load bearing capacity as compared to single row ball bearings. Double row ball bearings applications could be seen in air conditioner clutch. Thrust ball bearings are designed to bear thrust load i.e. axial load only, they will not bear any radial load. Thrust ball bearings components, as shown in figure, are separable and hence could be fixed separately i.e. one by one. Load line will travel parallel through the balls to the axis of shaft. 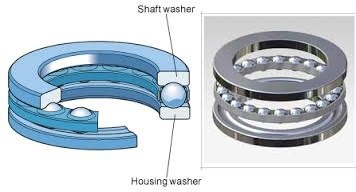 Thrust ball bearing will have very less axial displacement and they can bear heavy thrust load. For heavy loading, normally flat shoulders are preferred on shaft washer and housing washer in case of thrust ball bearings. We will continue our discussion in next post with quite interesting topic i.e. “Bearing removing and cleaning procedure”. How do hydraulic servo valves work?